Easy to Use - Cut MP3 music to pieces in few clicks. 40+ Formats Supported - MP3 Cutter supports more than 40 popular audio & video formats. Audio Converter - Convert audio files between MP3 and other formats. Audio Extractor - Extract music from video files to MP3 format. Ringtone Maker - Make ringtones from any audio or video files. (1) - Open a MP3 audio file. (2) - Click Play button and select the Start Position and the End Position. (3) - Click on Save button to save the new audio. MP3 Cutter is a Windows desktop utility allows you to cut and split a big MP3 or video to small audio pieces. With MP3 Cutter, you can split and cut not only MP3 format, but also WMA, WAV, AMR, WMV, AVI, MPG, 3GP, MP4, FLAC, OGG, WMV, MOV and more than 40 audio & video formats. Probably you have downloaded an MP3, MP4 or other video format files from the web or even recorded a track onto your device. You can also get an audio track by extracting it from a YouTube video. Well, you have the file but there is some stuff at the end or the start of the audio or video, and you want to eliminate these parts. Do you have to pay hundreds of dollars to get a program that can trim audio or a simple video file? 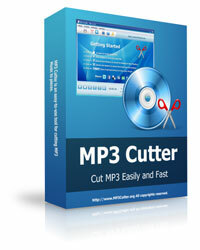 MP3 Cutter is a reliable program that allows users to cut MP3, MP4, and other video files. It's fast, stale and supports a broad range of file formats including MP3, MP4, and more than 40 different video formats. Regardless the video or audio file format you intend to trim, this tool will enable you to create the exact file you need. Note that an audio file format is commonly used for the storage of digital audio data in a computer system or other devices. The bit layout of the audio data is known as the audio coding format. It can be compressed or decompressed using the right program. In some cases, the data can be a raw bit-stream in the audio coding format. However, it's normally embedded in an audio data format with a specified storage layer. If you intend to cut such a file, you should do so without messing up the quality of the entire file. That's exactly what MP3 Cutter does. Why cut MP3 or video files? There are numerous good reasons you may want to cut an MP3 or video file. For instance, if you have favorite audio or video track that you intend to use as a ringtone, cutting the track will allow you to extract the part you like most. You can also cut and use your favorite guitar solo or riff from a MP3 file or video file and use it as your morning alarm or SMS notification. You can also cut a MP3 file to fix files or recordings that are damaged. For example, if you recorded a file from the radio, you may realize that at the start or end of the audio there is information you don't want. Besides, you may want to trim an MP3 or video file to reduce its size or even compress the files. No matter why you want to cut MP3, MP4 or other video files, MP3 Cutter allows you to handle your files without compromising on their sound quality. Unlike many online MP3 cropping tools available in the market today, MP3 Cutter, an offline audio and video file cutting tool, offers you a secure solution to conduct a file cropping process. You don't have to upload your audio or video files to a cloud to trim them. You don't need to be a professional audio editor to use the MP3 Cutter. In fact, the complexity of some audio editing tools might scare you especially if you are new to such tasks. However, it's the price tag that sends you running. Fortunately, MP3 Cutter is a cool and easy to use tool that allows you to trim your audio and video files with just three simple clicks. It's a highly convenient tool. Whether you want to cut and resize the soundtrack of your home movies or a tool to create a simple ringtone for your mobile device, MP3 Cutter is a good choice. It can convert audio files between MP3 and other formats, extract music from video formats, and more.